Try this website: www.booking.com I've used it a lot while travelling os. Always found a bargain somewhere. To add to that, I've used www.wotif.com.au or www.lastminute.com.au for overnight accomodation interstate, though they tend not to have the listings available until 2 weeks out from when you need it. But if you have net access in Perth that might be fine. Staying in Sydney for a few days depends what you want to do or see. Obviously the city has it's advantages and is central to train trips around the place, as well as ferries over the harbour to Manly for the event you are going to. Sydney Olympic Park is another area with accomodation, though public transport out is slightly more limited, and not nearly as scenic as the city and harbour. If you are planning on hiring a car then location is less important, but be aware that during peak hours some of Sydney's roads are abominable, even more so if there is a crash or something. If your preference is bush caching rather than city then maybe stay somewhere west like near Parramatta and have a car to head out. But if the priority is to see the famous Sydney sights then the CBD would be better. Jim, you can buy Garmin maps of Aus/NZ on Ebay. The nuvi should have a card slot on the side that you put the chip in. Not sure, but It might be cheaper to buy it here and mail it to you're daughter. It sure is nice to have the detailed maps when exploring new areas. What else do we want to do in Manly? Do some of the caches highlite other interesting places to visit? Or do other interesting places have caches, too? 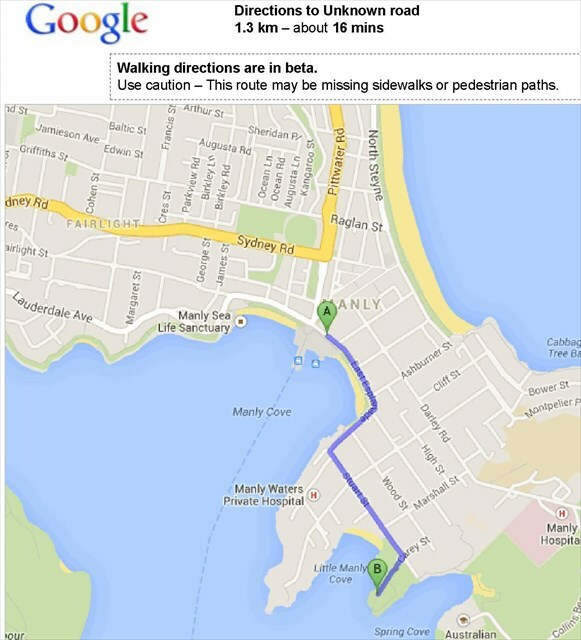 What is the distance from the ferry docks in Manly to the event site? And how do we get there - walk? taxi? etc? We will be 3 adults. Will the ferry or bus still be running when the event ends? Manly sounds like a nice place, but we don't want to get stranded. We'll be staying in Sydney in a hotel near Circular Quay. For public transport in NSW, www.131500.info is your friend showing all bus/train/ferry services. Ferries from Manly back to Circular Quay basically run all evening about every 45 minutes up to past midnight so that won't be a problem. The event is probably 1-1.5km walk from the ferry wharf, though I am sure someone there will be able to give you a lift back, or with organising a pickup from the wharf to get you there. As with anywhere, where there are interesting places there are caches. Unluckily of course there are also a lot of caches in boring places. The problem is knowing which are which, and not having done a great deal of caching in that area I am not necessarily sure which ones are must do. If on the map they appear next to the harbour or ocean they are probably good. If they appear in suburbia then they are probably boring micros hidden for no other reason than to hide a cache (something I try to avoid doing). But that's the same across most of Sydney, not just Manly. Manly has some great walks. Either along the harbour foreshore (come out of the wharf and turn left and keep going) or along the beachfront to Shelly Beach (come out of the wharf, straight across the lights, up The Corso to the beach front, turn right and keep going). If you like cafes there is no shortage in Manly. If you like geocaching I would recommend Doctor Who - Sky Sharks, Doctor Who - Silence in the Library, Doctor Who - The Wishing Well, and The Bower. In a fit of outrageous self-promotion, if you have 2 hours and you enjoy wherigo's, then try Henry and the Boomer, which takes you on a guided tour through Manly plus throws in some historical background and a few puzzles. Jim & Chris & Becky . . . Just an update on the situation in the Blue Mountains. We've had a fair bit of rain here, on and off, and the fires are out. Most people who visit us here in Leura ask where the fires were burning. You can spend a lot of time driving around these parts and never see any fire damage at all. So I hope you still have the Blue Mountains on your geocaching list. Only the Winmalee/Yellow Rock area should be avoided, because that's where 170 plus houses burned, and they're presently re-building there. Some remote geocaches were destroyed, but most are still in place and ready for finders. We are planning on a tourist bus excursion, a 'hop-on-hop-off' bus trip. No details yet, that's coming, but beautiful stops at various points of the Blue Mts is promised! I should have said that swimming and surfing at Manly Beach are an attraction for many people. Right now the water temperature is 67 farenheit which is fresh but swimmable. 67 degree F water temps? Sounds terrific. Our little lake in Wisconsin USA has been frozen over for almost 2 weeks! Our daughter has been to the beach in Perth several times, and she is enjoying the wonderful weather. We should have room to haul several trackables from the Manly Christmas event back to north central USA. We have at least one coin (and maybe a few more, we'll see how many we leave in AU caches by then...) that we intend to drop there, the Reef Check. It needs to head up to the Great Barrier reef, then back home. If you have a trackable you'd like to send back with us, or one that has an international mission, bring it to the event and we will grab it. Thanks, update appreciated! We are planning on a tourist bus excursion, a 'hop-on-hop-off' bus trip. No details yet, that's coming, but beautiful stops at various points of the Blue Mts is promised! A number of my hides are located at or near bus stops and popular lookouts. Hope you'll find a few of them! We'll be at the Menzies Hotel in Sydney, near Circular Quay, Dec 7 - 13. Apparently they charge quite a bit for Wifi access, and do not have online access wired into the rooms (or perhaps do, but for additional fees). We are used to having Wifi all over the place. Anybody have any knowledge of places near the Menzies that have free Wifi? Cafes? Libraries? Thanks a lot. We begin our journey in about 24 hours. After a week in Perth we'll head to Sudney. Looking forward to meeting some of you in person at the 11.12.13 event. And those we do not get to greet in person, thank you for your presence in these forums. We feel like we already know quite a bit about Australia. The personal advice and suggestions and insights is always so much better than reading canned tourist websites. The library near town hall offers wifi as do all Mc Donalds and most cafes in the CBD will have free wifi if you have a coffee. Just ask when you order. All Gloria Jeans cafes have free wifi. Scrolling back, I don't think this has been covered. What device do you want to use the Wifi with? Are you bringing a laptop with you? If so, you might prefer to look at a Prepaid broadband internet device, preferably with Telstra. You can get one from $49. Its only 3G, but the difference between 3G and 4G is bugger all, certainly not worth the extra $50. You can recharge almost everywhere, corner shops, supermarkets, service stations, etc. Others may be able to help you out with further information regarding this. As Tronador has already said, most cafes & McDonalds have free wi-fi access. I've used the one in the outdoor eating area behind Australia Square with no problems. You don't need to order anything at this one (at least you didn't last time I was there), but there are lots of places around that make nice coffee and bacon & egg rolls (I usually have breakfast there before early morning meetings in a nearby office block).